When summer heat and icy trout streams come together, imagine fishing all day in your favorite khakis. Only without the soggy feet and goose bumps. That&rsquo;s the concept behind our Gunnison Gorge Wading Pants&mdash;max comfort in hot-weather/cold-water conditions. Built with Single Seam Construction that routes critical seams away from areas of highest wear for increased durability and our tested-and-proven 4-layer, H2No&reg; Performance Standard fabric with a waterproof/breathable barrier and DWR (durable water repellent) finish, the Gunnisons keep you dry and comfy from the waist down. 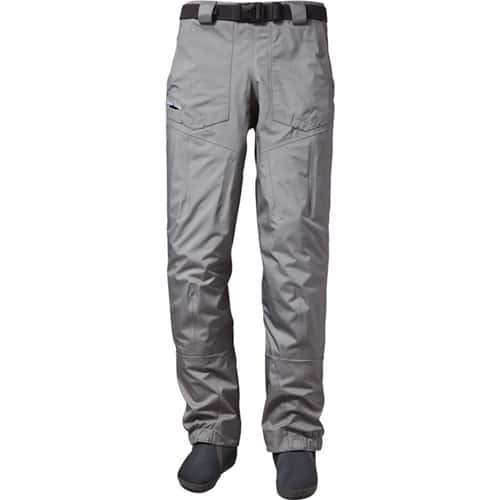 Out of the water, they look and feel like regular pants, with a side gusset that creates a clean-fitting tailored waist and makes them easy to get on and off, self-fabric belt loops and a stretch wading belt with a low-profile buckle for an adjustable fit. Anatomically curved knees and a modified Y-Joint crotch increase flexibility, while the new flat-panel gravel guards drain water more quickly than our old design and resist abrasion and wear while hiking or wading. Below the new gravel guards, our improved booties have a more anatomical, sock-like fit and are made from a denser 4mm neoprene that resists compaction better over the long haul. And because you&rsquo;re always just one step away from an unintended swim, the internal, waterproof TPU-welded utility pocket protects camera, phone or alarm remote. Field repair kit included.